Last Thursday I published part 2 of the Gondola KAL (and forgot to blog about it). I published a revision to part 2 on Friday morning as I decided to add a second repeat of the lace pattern. 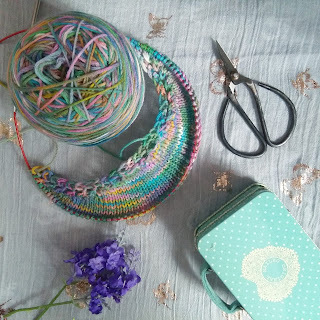 In my Periscope broadcast on Thursday I talked about how to read your lace knitting, how to read lace charts, and using lifelines and stitch markers to make your lace knitting easier. I've previously done a Mini Tip Monday blog post about using lifelines. Read it here. If you haven't joined the Gondola KAL yet, there is still time to catch up. Read all about it here. I haven't set a specific date yet for the release of part 3. As I'm designing this shawl as we go, I'm hoping to do a Periscope broadcast on Monday or Tuesday to talk about designing part 3. We're on holiday next week but we're staying home so I don't want to commit to a specific time until I know what we're doing.